The fame of ZAIDA as she was originally known, for some time at least, came close to eclipsing that of her older eminent and illustrious fellow Chinchilla, 'Ch. Silver Lambkin'. But whilst his fame was associated with his huge ongoing contribution to the breed as a stud and the sire of studs and queens, her fame was associated specifically with her obvious beauty, more particularly for her unmarked clear silver coat and her amazing run at winning top honours at shows. In this respect, she continued to be a flagship for the breed, and the high bar for Chinchilla breeders everywhere to emulate. And what was equally astonishing, was that she was not from the 'Lambkin' strain herself, both her sire and dam being from unrelated lines. In this respect, she continued to be a flagship for the breed, and the high bar for Chinchilla breeders everywhere to emulate. For some years, in fact, she was the most well-known of all Longhairs, collecting win after win in much the same way as her shorthair contemporary, the sable classic tabby 'Ch. Xenophon', who became famous for amassing what would have been an insurmountable tally of wins in the Shorthair Division. She likewise continued to collect a remarkable tally of her own. 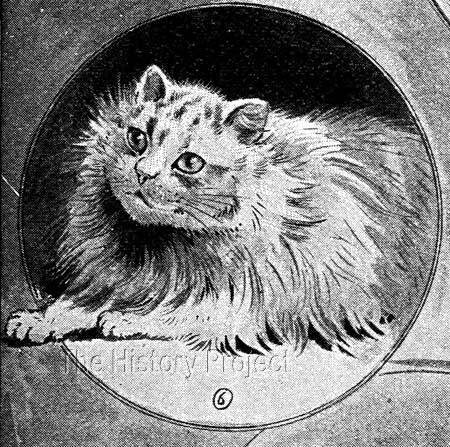 Her fame and beauty was international, and kept the focus of longhair breeding firmly centred on what was considered to be a truly English breed of longhaired cat, the "Chinchilla". In fact, the two most popular longhair varieties were, at this time, Blues and Silvers (Chinchillas) with both varieties being bred side by side by nearly every major breeder in the country. And for those that were specialising in colours other than Blue, the Chinchilla was nearly always their primary or secondary variety. 'Zaida' was born 15th February, 1895, bred by Mrs. Bluhm, of Lyndhurst, Manchester, who over a number of years collected and bred from some of the most outstanding silver bloodlines available in Great Britain. In this case, she bred her modest chinchilla female, 'Silvie of Lyndhurst', to Mrs. 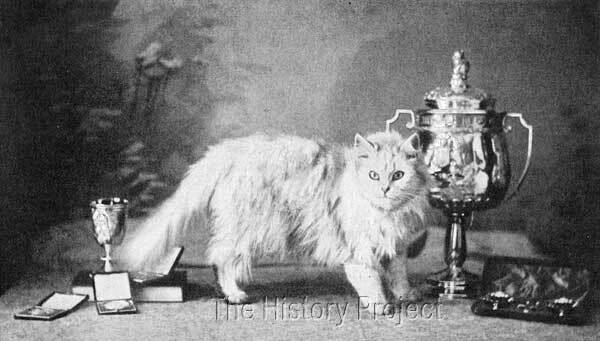 Balding's recently acquired 'Silver Laddie', a formerly unknown male who had taken the silver world by storm with a dramatic win at the Crufts Show of 1894 by taking the coveted First and a Cup in the variety. On that occasion Mrs. Balding wasted no time in obtaining him for her breeding program, for the specific purpose of an outcross. This farsighted move not only gave her the ability to move forward with her own program with confidence, but also the many breeders with whom she shared her lines. 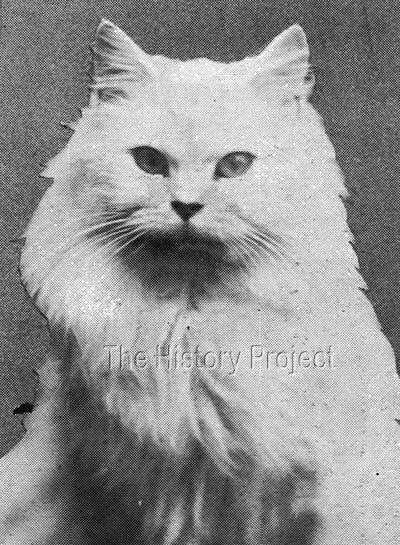 Her dam, 'Silvie of Lyndhurst' (NCC: 1884) ² was a modest chinchilla female, born in 1892, bred by a Mrs. Hurst, from an obscure sire named 'Punch' and an equally obscure dam named 'Tabby'. 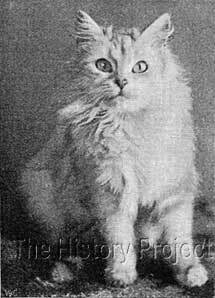 Despite the paucity of information about 'Silvie's' heritage, something about her must have appealed to Mrs. Bluhm, who had a good eye for a cat and who already had a reputation as an astute breeder. So, on the whole, from the combination of these two relative unknown bloodlines, was produced this amazingly beautiful, clear-coated female. 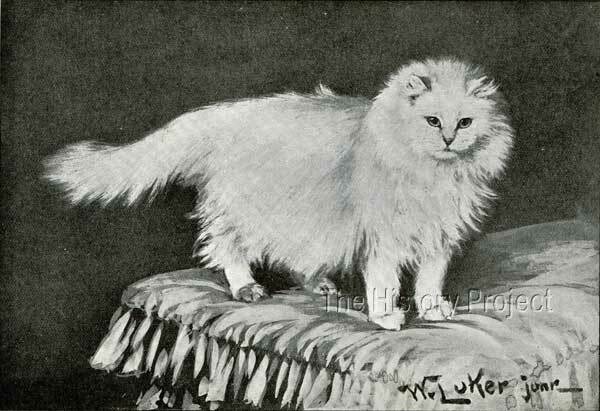 The only other record of 'Silvie of Lyndhurst' is in the 're-entries' in Volume V of the National cat Club, where the spelling of her name has altered to 'Sylvie of Lyndhurst', her ownership remains the same, and her win at The Crystal Palace, where she took a second in 1897, is duly added. 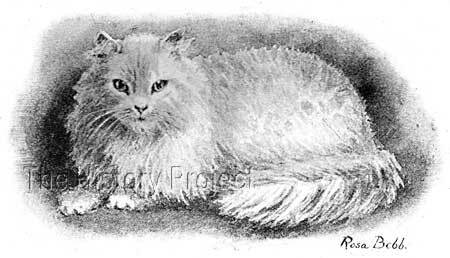 'Zaida' first appears in Volume IV of the National Cat Club Stud Book and Register, which was compiled with all entries between March 1895 and March 1896. Upon her initial entry, the breeder and owner are both listed as Mrs. Bluhm. 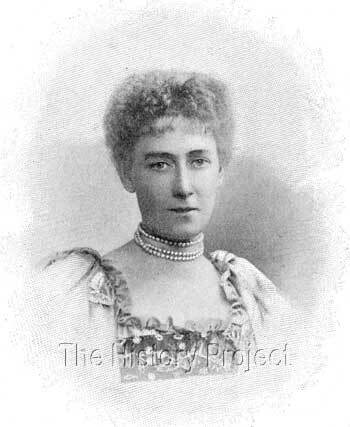 But by the time of the publication of Volume V, (covering the period 1896-1899), she appears a second time in the 'Re-entries' under the ownership of Miss Gertrude Willoughby, along with her major wins between 1896 and 1899. 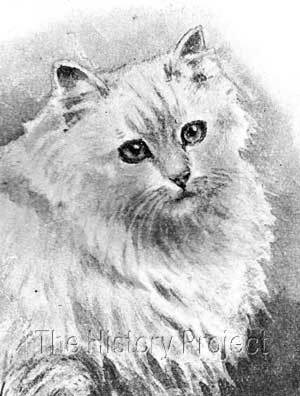 So it is unclear as to exactly when she became the property of Miss Willoughby (later Lady Decies), but it is likely to have been while she was still quite young, possibly as early as when a kitten in 1895 or a young adult in 1896. 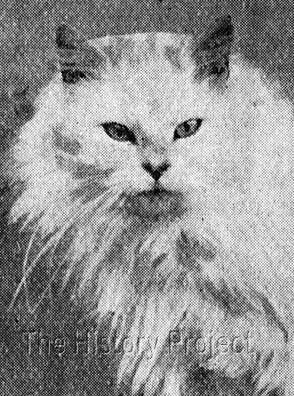 "When the Fulmer cattery removed from Slough to Birchington-on-Sea, on the occasion of the marriage of Miss Gertrude Willoughby with Lord Decies, there was just a question in the mind of those in the beautiful cats bearing this prefix as to whether they would maintain their ascendency in the show world! But, fortunately, for all those concerned, Lord Decies takes quite as warm an interest in the cats as does his wife. He has been all his life as keen a fancier as he is a sportsman, and the fact of his being the master of the harriers, and greatly attached to his stables and kennels, does not make him look down upon the cat as an inferior animal. Lord Decies has bred cats himself for 15 years, and owns to an interest in even smaller animals of the furry type. At the present moment at Birchington, there is a 'bird room' containing some very choice specimens. (One cockatoo has really the sense and affection of a child!). A tame mongoose, which will go through a series of tricks at the bidding of its mistress, and one or two valuable and rare Toy Bull-terriers, which have the run of the house. But the cats are very prime favourites both with Lord and Lady Decies, and the pretty and tasteful rooms at Beresford Lodge are full of the signs of their presence and the trophies they have won. Several beautiful portraits by Luker stand about on easels, and in the middle of one long room is a gilded show pen on a polished table, for the convenience of showing off any cat which may be brought in for inspection. Lady Decies managed two catteries, one at her usual residence at Beresford Lodge, and another at her summer residence at Birchington-on-Sea. Frances Simpson gives us by far the best account of the arrangements at Birchington, as well as a little insight into the preferred place of 'Zaida' in Lady Decies heart. 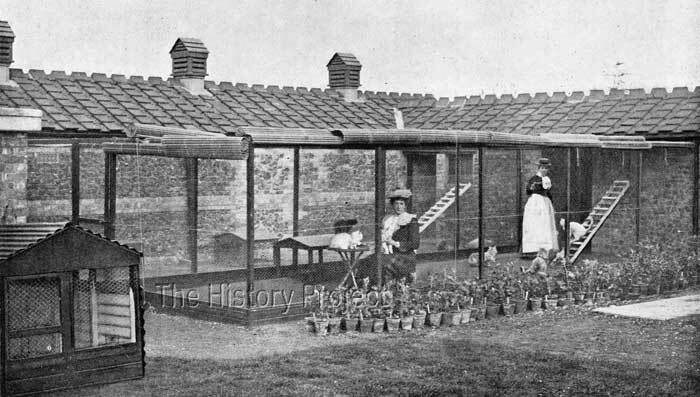 "Lady Decies' catteries, at her pretty summer residence at Birchington-on-Sea, are indeed most perfect in their arrangements, and every detail for the comfort and well-being of the inmates is considered. The stud cats have separate single houses, with good-sized wired-in runs, and luxurious and cosy sleeping apartments in the rear. "The main cattery is in a sheltered portion of the grounds, and will accommodate a large number of cats. The runs are arranged with boxes, benches, chairs, and ladders, and the sleeping places, built of brick, are most comfortably set up. By a system of wooden blinds the strong sea breezes and the bright rays of the summer sun can be regulated. There are side blinds and top blinds. The floors of the spacious catteries are wood, covered with cork carpet, and they are raised about a foot from the ground, so that there is a free current of air passing under the boards, thus securing absolute freedom from any damp. 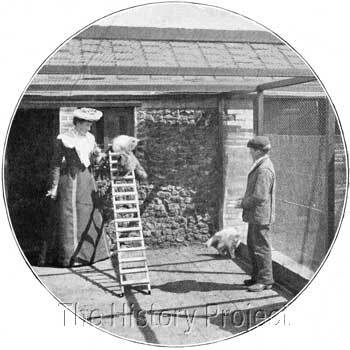 Above left: At the entrance to one of the long cattery exercise runs, Lady Decies visits her pets, while the cattery boy looks on. 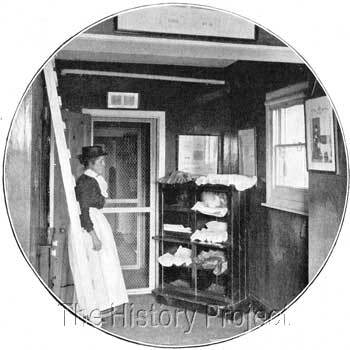 Above right: Inside the cattery, the cattery attendant stands besides one of the sleeping boxes. Lady Decies owned some of the most renowned cats ever to be exhibited. At the time that Frances Simpson wrote her epic work for Cassell's, Lady Decies owned, 'Zaida', the world's most famous Chinchilla female, 'Lord Southampton', arguably one of the most reputable and desired Chinchilla males and a son of 'Ch. Silver Lambkin', and the redoubtable 'Ch. Xenophon', the Brown Tabby Shorthair who represented one of the very few cats who could compete at a level equal to 'Zaida'. 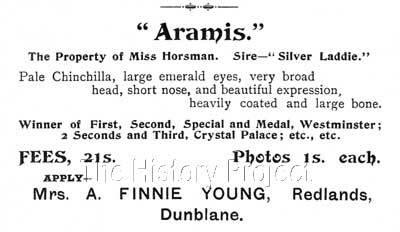 'Stud advertisement' for Miss Horman's 'Aramis', sire-sibling of 'Ch. Fulmer Zaida'. 'Aramis' was at this time, under the supervision of Miss A. Finnie Young. The show successes of 'Zaida' were without parallel in Britain for more than 60 years. She carried off more than 150 prizes, including medals and specials, and her crowning achievement was being twice selected as Best Cat in Show, at the Crystal Palace! 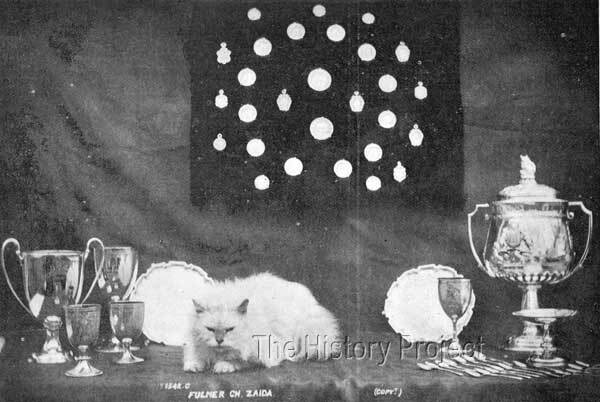 'Champion Fulmer Zaida' surrounded by some of her Prizes, including the coveted National Cat Club Trophy, awarded to the Best Cat in show at the Crystal Palace. This she succeeded in winning twice. Featured at the top of the trophy is a likeness of the immortal 'Ch. Silver Lambkin'. 'Zaida's' successes were only naturally met with a combination of awe and admiration, but also a certain amount of angst. This was not because of her wins, but because, as a singularly clear-coated specimen, one or two admirers found it difficult to believe that anyone could breed anything as good, basically claiming that she was a 'sport' or in today's vernacular, 'a fluke'. As an example, the following is an excerpt from a letter to the editor of 'Our Cats' published on 15th October, 1904. Of course today, we have the benefit of hindsight, and we can quote: 'If at first you don't succeed, try, try, try again!' We know now, that 'perseverance and selection' did in fact win the day and that, within less than 20 years from when this letter was written, a good number of clear-coated chinchillas were indeed being produced and exhibited with success. These, of course, went on to become the foundation of the clear-coated beauties of the latter twentieth century. 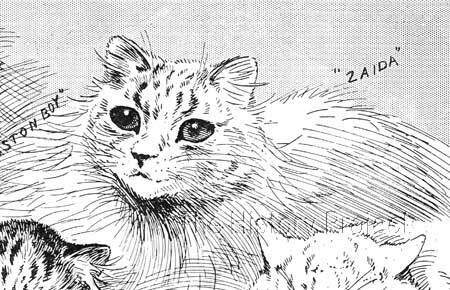 This statement clarifies two points of interest, the first and most obvious being the confirmation that 'Zaida' was in fact a perfectly normal dam of kittens, capable of producing admirable progeny, even due to an apparent lack of verifiable information! The other, provides us with information as to the ownership of 'Fulmer Pearl', who happens to be the only precious daughter of record. Of all the males she could probably choose from as a mate for her 'Zaida', 'Ameer' was an interesting choice by Miss Willoughby. His dam was 'Lambkin Queen', who combined 'The Nizam' (an outcross line also owned by Mrs. McLaren Morrison) and Miss Balding's 'Beauty of Bridgeyate', the dam of 'Ch. Silver Lambkin'. One cannot help but wonder whether she had possibly taken this route upon the advice of Mrs. Balding, who very probably took a personal interest in how such a famous and strikingly beautiful chinchilla female should be bred. To date, no photographic evidence of 'Fulmer Pearl' has been located. The sire and dam of 'Fulmer Pearl'. Above, two images of 'Ch. Fulmer Zaida', the first from a photo by E. Landor which appeared in 'Windsor Magazine, in 1900.1 The second is from 'The Bystander', published in November 1905.11 The second photograph in particular gives us a much better view of her clear, unmarked coat, and which bears a remarkable likeness to the portrait of 'Zaida' by W. Luker Jnr, shown below. 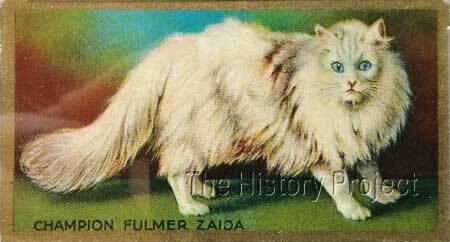 'Champion Fulmer Zaida', a painting by W. Luker Jnr. 'Champion Fulmer Zaida' photographed at The Crystal Palace 1903. 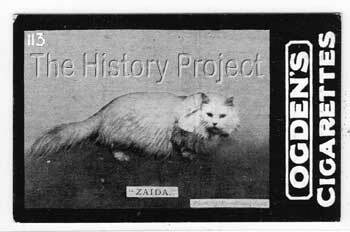 When this photo was published, 'Zaida' was one of the most debated of long-haired cats in feline history, representing the epitome of 'chinchilla' breeding up until that time. Among a photo-shoot of "Champion Cats at the Crystal Palace". 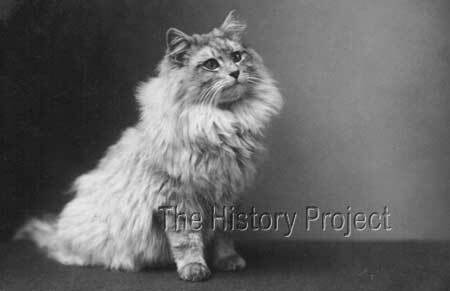 which featured a number of Championship cats in the series of 200 photographs. No. 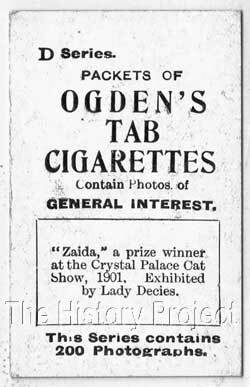 113 featured 'ZAIDA', a prize winner exhibited by Lady Decies at the Crystal Palace in 1901. 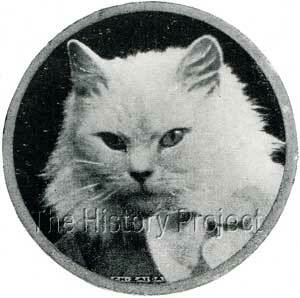 Images from the Ogden's Tab Cigarette Series of feline cards in The Harrison Weir Collection. 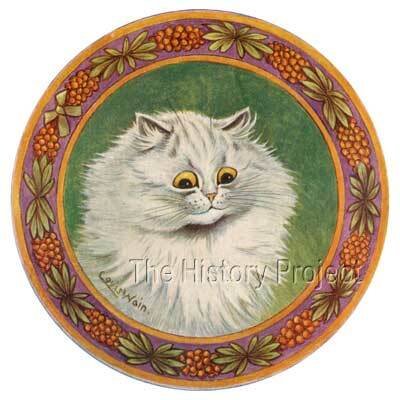 Lady Decies was extremely fortunate to have owned three of the most significant and sought after cats living at the turn of the 19th and 20th centuries. These were the two outstanding chinchilla's in the form of 'Zaida', by 'Silver Laddie', and 'Lord Southamption' by 'Ch. Silver Lambkin'; but also the superlative brown tabby English short-hair 'Ch. Xenophon'. These three were literally 'giants' of the show ring. 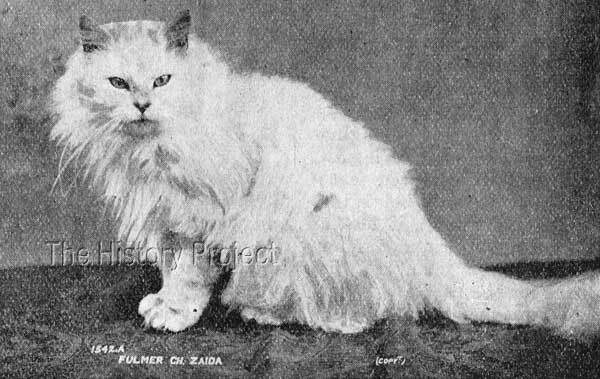 'Zaida' was the pride of the Fulmer Cattery, and was treated like a queen among cats. She was upheld as the epitome of her variety. She was, in her own time, an enigma; the evidence of things hoped for, and the promise of things yet unseen.